1. The problem with health goals. "It would be silly to have a goal to be honest and then tell the truth one day and cross off honesty from your list. The problem here is that honesty is something you value, it isn’t really a goal, and you can’t ever be done with it. Honesty is something you continually work on, consistently making efforts to be truthful and forthright." Give it a read! I would love to hear your thoughts and if you had any "aha" moments while reading it too. 2. My first TV segment. This weekend I had my first TV segment on ideas for healthy kids lunches. I haven't watched it yet because ugh that gives me anxiety. But I think I did pretty OK for my first time, and was glad that I was able to sneak in some non-diet messages ("kids need both fun foods and fuel foods"). I've always loved the idea of drinking bourbon, but I never really liked the taste. Luckily for us, one of our dear friends is an actual bourbon connoisseur, with probably 200 bottles of hard to find bourbons at his house. Him and his wife were nice enough to have Scott and I over for dinner and a bourbon tasting this weekend, and guess what? Now I like bourbon! It probably helped that it wasn't the Evan Williams I used to drink with vanilla coke in college - bleh. I had a bunch of people on instagram respond to my stories asking what the "trick" was. Apparently I'm not the only aspirational bourbon drinker. A couple things helped. For one, starting with bourbons that had a lower proof - eventually I tried a 107 proof Rip Van Winkle that I loved once I got past the burn. It also helped to add a few drops of water - they had a dropper filled with limestone water from Kentucky (like I said, actual connoisseur). But the thing that helped most was employing my skills in mindful eating, or in the case, drinking. I think because I didn't like those first burny sips, I would just shut off my taste buds. By paying attention to the burn and tuning into it, I realized I actually enjoy the warmth of it. It's kinda like with mindful movement, how tuning into my burning lungs when I run makes it fade away. Having a tasting sheet in front of me with all the different flavor profiles, I was able to treat it like wine or cheese tasting and figure out what flavors I like. I rephotographed my recipe for millet bowl with black beans and pico last week, and it reminded me how much I love cooking with millet. Have you ever had it before? Millet is an ancient grain that's similar in texture to quinoa, but has a less bitter, sweeter flavor that kind of reminds me of corn. 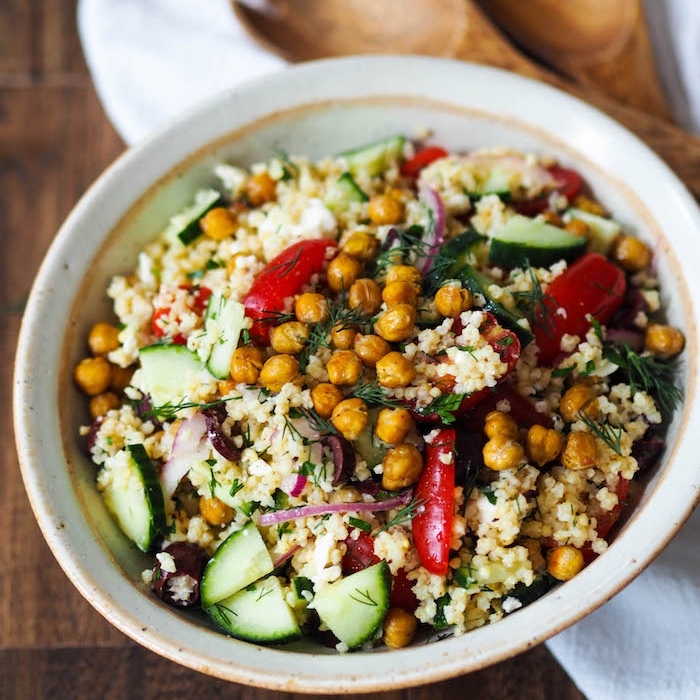 If you like it, I also have this recipe for a sweet and spicy tofu millet bowl with citrus-miso dressing, and this mediterranean millet salad with crispy roasted chickpeas that you should check out too! 5. This MyFitnessPal truth bomb. I saw this on instagram (originally posted by @corporatenutritionist) and I was like, YUP. I remember calculating my calorie needs on MyFitnessPal when I was a nutrition student, and being so shocked by how low my recommendation was. I ended up recalculating it a few more times so I could get a few more calories - and that's when my idea of how many calories we need was skewed waaaay lower then where it's at today. The thing is, even if MyFitnessPal didn't underestimate calorie needs so drastically, there really isn't ANY good equation to estimate calorie needs that's accurate for everyone. One of my fellow dietetic interns at Emory did a project comparing the different equations for estimating needs, and basically she came to the conclusion that none of them were all that accurate, especially if you're at a higher weight. Plus, your energy needs aren't static. It changes day to day based on physical activity, hours of sleep, temperature, time of the month, etc. Caloric estimations can be useful in some cases for dietitians to know, like for example helping a client with an eating disorder weight restore, or calculating how much tube feeding to give someone who is critically ill. But even if we could know exactly how many calories you would need in a day, I think using that number for making food choices would be a lot more likely to lead to anxiety, stress and obsession around food than anything else. A more accurate way of estimating your energy needs is listening to hunger and fullness cues, and honoring them most of the time. Your body wants to be fueled adequately with energy, not inadequately or excessively. So instead of spending your time trying to figure out how may teaspoons of olive oil made it into the soup you made so you can accurately calculate how may calories were in it, think about whether it satisfied you until your next meal or snack. Note, if you're in eating disorder recovery, your hunger/fullness cues might not be very reliable, so it's best to use a dietitian created plan to ensure you're adequately fed.